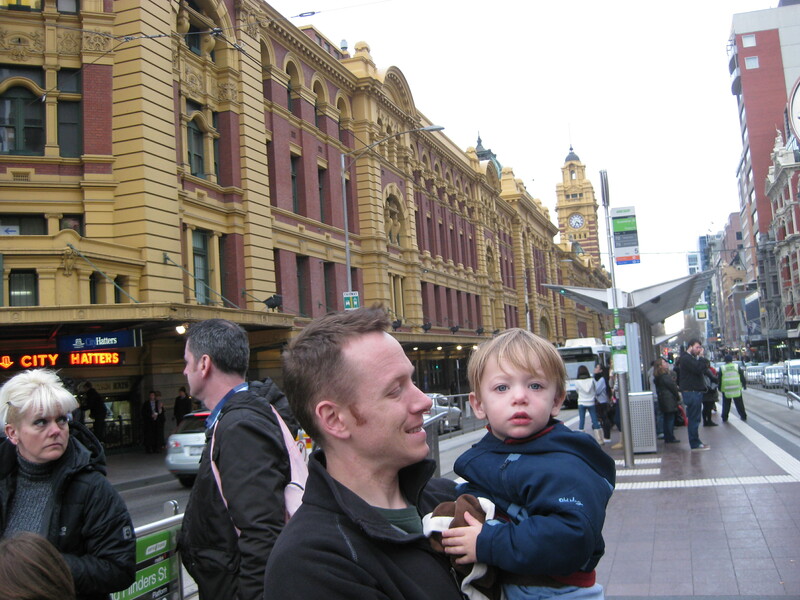 We’re at the end of our time in Melbourne so I thought I’d (JMP) blog about our experience here. As suspected, we’ve decided it is unfair to visit any city soon after Sydney. For us, Sydney is such an unbelievably beautiful place that it’s an impossible act to follow. That being said, we’ve liked our time here a lot although we haven’t explored all that much. We were constrained by our short time here, the rainy weather, and of course traveling with a toddler who doesn’t tend to walk in a linear fashion and is too wiggly to sit in his stroller for long periods of time. We spent our time in the Central Business District and it was fun to be here on a weekday to see the rush hour traffic and see just how many people live here. There is a river and harbor area but the city isn’t really centered around the water like Sydney is. The harbor area reminded us of Auckland and featured a big, new retail center with shops and restaurants for the tourists (and maybe the locals too). The river had a similar spot across from a busy commuter train station with a giant outdoor TV and some shops and restaurants and some cool modern architecture. The few older buildings we saw were juxtaposed against this newer area and it made for a pleasing contrast. For some reason, along with a free third night at our hotel we were upgraded to a suite on the top floor. We have no idea why but it was pretty cool. EP, who is completely obsessed with planes at the moment, enjoyed looking out over the city and seeing planes flying into the airport not far away. The adults enjoyed the two rooms with a door in between so that it wasn’t lights out for everyone at 7:30 pm. All in all a fun trip but we’re ready to get back to our little routine in Canberra. TP ADDS: A great description. The only thing that I’d add is that as far as I’m concerned, Sydney : San Francisco :: Melbourne : Toronto, with two small exceptions. (1) that it’s not fair that we visited Melbourne in their winter (it is normally quite warm here, and hasn’t snowed here in several decades) so the Toronto comparison might be a function of that. (2) Melbourne is a “hip” city, music and art-wise, in a way that doesn’t quite parallel any other North American city.